We're Awakening! 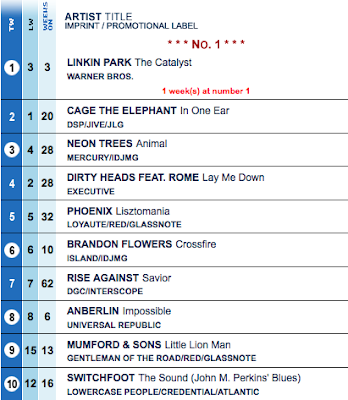 : Chart Wednesday (Week of September 4, 2010): TOP 10! 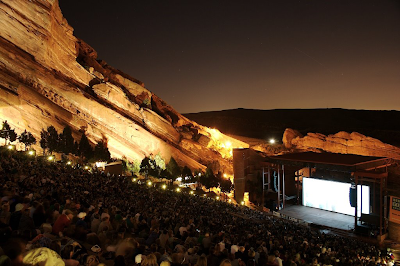 ; "safe to say we all have a crush on red rocks." 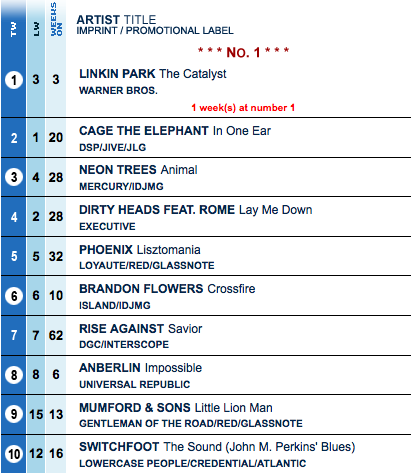 Chart Wednesday (Week of September 4, 2010): TOP 10! ; "safe to say we all have a crush on red rocks." It's official, folks. In what is a confirmation of Monday's report, "The Sound (John M. Perkins' Blues)" is one of the Top 10 Alternative/Modern Rock songs in the country! Coming in at No. 10 this week, "The Sound" jumps two spots to make itself the third top 10 alternative single for the band. Some Mediabase charts are reporting increased spins for the track over the last few days since, so we could be seeing an even higher position next week! I'd like to take this moment right now to congratulate every single one of you who has requested the single tirelessly, voting on polls, and carrying out Footsoldiers missions tirelessly. It is because of you that this single is starting to take off, and the band is all very excited! GREAT WORK. In "Your Love Is a Song" news, the track holds steady at No. 39 on Adult Pop Songs (Hot AC) and falls on Christian CHR from 13-16 and 20-21 on Christian Songs. We are waiting for word on when the focus shifts to "Your Love Is a Song," but we are definitely going to keep pushing the success of "The Sound" on Modern Rock radio for the time being. Follow @SFfootsoldiers for missions, news, and other bits related to helping out Switchfoot! ^That place looks ridiculous. I hope there is footage from that place on the next Switchfoot TV episode. i've seen many a @jonathanforeman aftershow, but tonight's might take the cake. safe to say we all have a crush on red rocks. NOTE: Right before this this aftershow performance, Jon Foreman said that the band has done a sound check demo of the new song, "Thrive." Jon Foreman covers Radiohead's "High and Dry"
BONUS COVERAGE: Latin America tour video promos!